1. 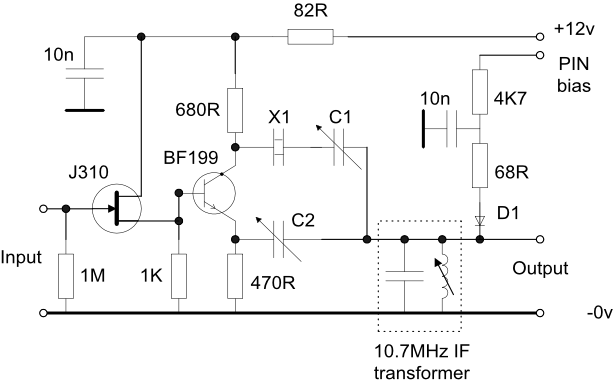 The following circuit is a single stage neutralised crystal filter at 10.7MHz although the principle may be used at any frequency for which crystals are available. Standard over the counter crystals showed signs of spurious responses close to the passband so some 10.7MHz mobile radio filters were disassembled and crystals selected for the same or very close series resonant frequencies. The bandwidth as set by the resistance of D1, a PIN diode, controlled by the positive PIN bias voltage, typically 0 - 12v. D1 should have a reverse recovery time of 1uS or more to minimise signal distortion with 10.7MHz signals. Capacitor C1 (typically 3 - 30pF) adjusts the series resonant frequency of the crystal and C2 (typically 2 - 10pF) neutralises the parallel capacitance of the crystal in order to get a symmetrical frequency response and the best stopband response. This type of filter section was developed for a spectrum analyser and was also used, less the PIN diode facility, and with the appropriate tuned circuit values to remove most of the modulation from the 198KHz frequency standard signal prior to being applied to the phase locked loop of an off air frequency standard. For an analyser, four or five of these filters may be cascaded in order to get added selectivity and stop band attenuation. The first section should be preceded by an LC filter at the filter frequency to protect the solid state devices from broadband signals typically found in an analyser. An eight section ladder filter was designed and constructed using 37.5MHz fundamental mode crystals and the photo to the right shows the frequency response. The -6dB bandwidth is 7.5KHz and the stop band is about 73dB below the peak of the passband which is fairly good for an unscreened prototype assembly. The design is based on an 0.1dB ripple Chebychev model and the characteristic impedance of the filter is 68ohms. The crystals were not matched but early measurements showed the series resonances to be very close. A 15KHz wide version to pass 25KHz channelised FM signals and a common PC board layout are in development.